There are many parts to a complete arm-mounted system. It is ideal to have one source who offers integrated system components designed to work together, with knowledge and experience to assist in optimal application design and installation for your project. Each element of an arm-mounted system should be easy to clean, offer antimicrobial properties to limit healthcare-associated infections (HAIs), and have healthcare-grade certifications, such as UL Listing, NFPA 99 Health Care Facilities Code, FCC, and OSHPD. Facility managers appreciate cen­tralized TV management for easy cloning, channel aliasing and channel remapping to customize TV line-ups. Also, consider integrations with gaming devices, DVD, DirecTV or satellite for more entertainment options for patients. Safety is of utmost importance when selecting healthcare power supplies. Low-voltage, UL-Listed power supplies reduce the risk of fires or shock to protect patients and facility owners. A well-designed, continuous power source is preferable to intermittent battery charging for long hours of use and reduces staff maintenance. The best option is a centralized power supply to power multiple units from a central location such as a closet, without the need for outlets at each location. 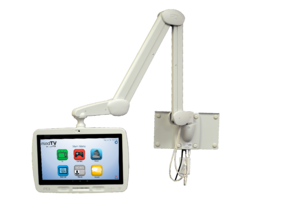 As the foundation of your arm-mounted patient entertainment system, the mount needs to be secure, theft-resistant, and blend in with the aesthetics of your patient room. There are many ways to mount a personal patient arm system, from the headwall, to sidewall, on the floor or counter, on a chair, from the ceiling, or even mobile tv carts. 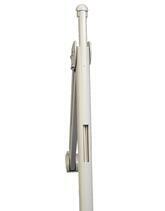 The arm delivers a comfortable, enjoyable experience for the patient, and cable management for the facility. 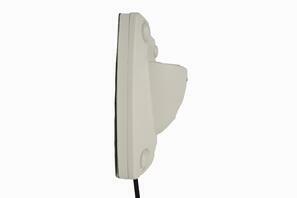 A good arm is UL-Listed, seamlessly hides the cables with no pinch points, and is well-balanced to stay in position. There’s nothing more irritating than a TV that gradually sinks because the arm is weak or not designed to support that device. A great arm allows maintenance staff to change internal cables in-place, with minimal disruption to patients. Whether a TV, a tablet, or a TV-tablet, the device you select for the patient needs to provide value to the patient and your staff. Healthcare providers can’t afford disruptions with device glitches and TV service interruptions. Choose a device built for healthcare with a proven track record, simple to navigate and easy to use. The TV must have Pro:Idiom to decrypt TV channels and should be able to run at long hours each day without risk of overheating or dead batteries. A great arm-mounted device will have high-quality speakers, a headphone jack, and cleanable touch screen. 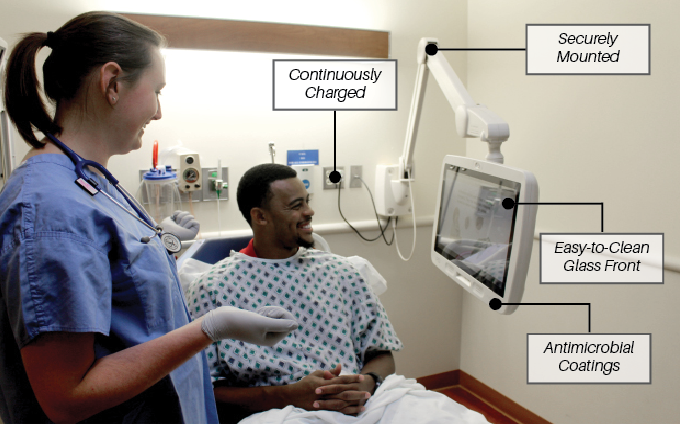 The best TV-Tablets have built-in entertainment apps, auto-wipe user data, camera/microphone options, and are capable to upgrade for patient education or added services. Vendors who offer site assessments and guaranteed installation ensure optimal project success for you. Take this information with you. Learn more about the products pictured.